Richard Vobes, the Bald Explorer and his occasional partner in crime, Jimmy Hastell, popped to the Bluebell Railway in East Sussex, to find out some of its history and experience travelling on old steam streams. Having recently shot an episode of the Bald Explorer around Petworth that featured Pullman Carriages, it was nice to revisit the audio podcast they had recorded a couple of years ago. 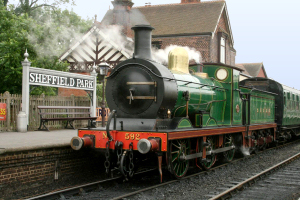 The Bluebell railway was the very first heritage railway to be established back in 1959. It opened to the public in 1960 which put it in a very good position to obtain quite a few unique and usual rolling stock as there were still many still running on the mainline railways up and down the country. Steam trains are operated between Sheffield Park and Kingscote, with an intermediate station at Horsted Keynes. The line was always known at the Blue Bell line, even when it was running as part of British Railways, due to the fabulous wash of colour from the flowers of the same name that run through the countryside in this part of East Sussex. Originally the railway was on the London route from the county town of Lewes and had closed as a result of the Beeching cuts. Have a listen to the various short podcasts produced of the trip to this wonderful heritage railway.